Aging affects our driving skills. Sad but true. I know my own eyesight isn't what it was 30 years ago, for example. I'm sure it will be even more different 30 years from now. And vision is just one element of driving ability. We all get older one day at a time. With "Baby Boomers" advancing into their senior years, however, the proportion of older drivers is growing rapidly in the U.S. Likewise in some other nations. That makes family conversations about driving by older adults important and timely. Such conversations need to begin long before a family reaches the "Give me those keys!" stage. Driving means independence. Independence means freedom of choice, freedom of movement—and dignity. 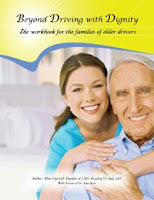 Enter "Beyond Driving with Dignity; The workbook for the families of older drivers." This user-friendly workbook was developed to offer concerned families a working roadmap (complete with actual exercises) on how to address the issue of driving safety with an older adult in your family. The workbook has been designed to offer additional peace of mind to families, help older drivers maintain their independence and dignity, and at the same time help prevent unnecessary deaths and injuries on our nation's roadways—not to mention our nation's storefronts. Many of the crashes chronicled on this site involved a senior driver. Some mistakenly hit the gas instead of the brake. Some mistakenly put their vehicle in "drive" instead of "reverse." Some, like the driver who hit me, didn't know what went wrong. StorefrontCrashes.com isn't about pointing fingers. It's about finding solutions. So, I'm interested in spotlighting resources that help drivers of any age—and their families—come to grips with issues that affect safety. Full disclosure: I'll make a small percentage off the sale of "Beyond Driving with Dignity; The workbook for the families of older drivers." Hopefully, extra proceeds can help in raising awareness about vehicle-into-building crashes. Driver behavior is only one factor in these crashes. Protecting people requires multiple strategies—because I believe accidents can happen despite drivers' best intentions. But this workbook is a great step toward addressing one of the prime vehicle-into-building accident factors. Please let me know how it works for you—via the comments area or with an email to mark 'at' storefrontcrashes.com. Your feedback will no doubt also be appreciated by author Matt Gurwell, founder & CEO of Keeping Us Safe, LLC. He lectures throughout the United States on topics related to the aging process and its adverse effects on driving skills. More about Matt in an upcoming post. He's been very selective about the platforms through which this workbook is offered, so my thanks to him for reaching out to you through StorefrontCrashes.com. Get your copy of "Beyond Driving with Dignity; The workbook for the families of older drivers" at: www.keepingussafe.org/workbooksc.htm.